Colladeen® Derma Plus contains one of the highest levels of anthocyanidins (plant flavonoids or PCOs) at 320mg per two tablets from extracts of grapeseed and bilberries, alongside green tea leaf and a full 6mg of pure free-form lutein. Research has shown all of these to be powerful antioxidants helping to block the action of the damaging effects of free radicals generated by sunlight. Colladeen® Derma Plus is specially formulated to support the health of skin and increase the body’s natural defences against sun damage. The formula provides the same strength anthocyanidins as in our Maximum Strength Colladeen®. Anthocyanidins are a group of flavonoid compounds found in dark skinned fruits, berries and even pine bark. Scientists studying these particular plant compounds have focused much of their work around the role they play in helping to support collagen, the tough protein that gives skin its elasticity. Both our Colladeen® products are the most potent anthocyanidin formulas available, providing a full 160mg of anthocyanadins per tablet. Many similar products provide less than 20mg per tablet! 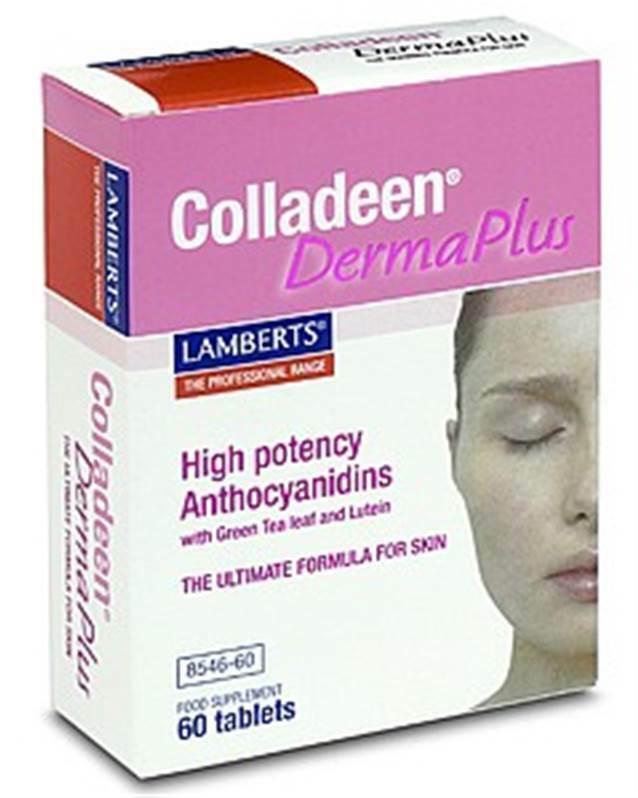 We have also included two further fascinating nutrients in Colladeen® Derma Plus, namely lutein and green tea extracts. These nutrients have been included because research indicates that lutein, a well known carotenoid, may play a protective role against the damaging effects of sunlight on skin. We’ve included a significant level of pure natural lutein in the formula to reflect the level used in a recent study. Colladeen® Derma Plus also includes vitamin C, which plays a role in normal collagen formation, together with niacin and biotin – all of which support the maintenance of normal skin. Calcium Carbonate Cellulose Tablet Coating (Hydroxypropyl Methylcellulose Colours: Titanium Dioxide & Iron Oxides) Crosslinked Cellulose Gum Silicon Dioxide Stearic Acid Magnesium Stearate. 2 tablets daily. These can be taken together or in divided doses. This product is not recommended for pregnant or lactating women. Whilst this product may reduce the damage caused by sunlight normal precautions should still be taken.